The Ketogenic Process — Dine on In! 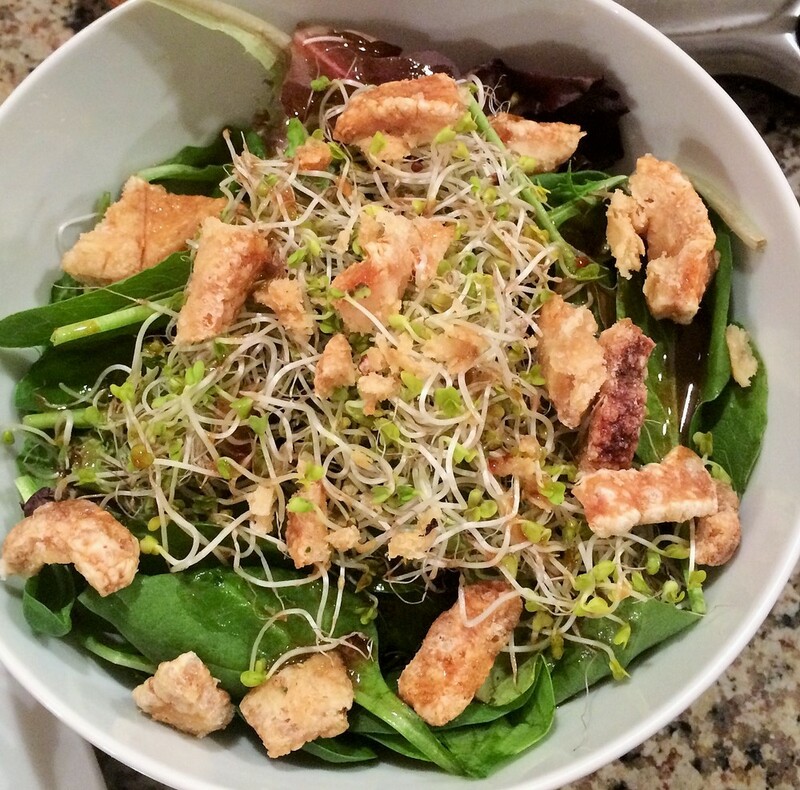 Green Spinach Salad with Chicharron Crisps. When, my dinner clients asked me to create them 3 weeks worth of 'Ketogenic Meals', I admit, I was a bit concerned and utterly intrigued all in one. Is that possible? I assure you, that I came home to research like a crazy person. Tweeting to rando's (random strangers), stopping chefs and starting a 'keto' dialogue. Reading blogs and wikipedia (I know, not a credible source... but come on!). [ go and google what keto means to you]. Weeks after taking on the challenge and seeing how great my clients felt after consuming copious amounts of veggies (yes, to clean eating!) and small amounts of fat (hooray we had marbled steak- can I get an amen! ), I realized, "holy, C#$p!, this stuff ain't no joke" I wondered WHY doesn't the rest of us eat like this during the week? I mean, honestly- it was a meal full of nutrients, nothing artificial (the perks of hiring a chef), sort of that "old school goodness your abuelitas, (nana's, whatever you called those domestic goddesses called grandmother's) cooked for you (if you're lucky) as a kid. I remember, tasting along as I added each seasoning, each fat layer, finalizing the sauces and the meals and totally going back to the days of being a child. I could see WHY my clients were happy. They didn't need any fillers- no bread, no dessert, no cafecito (coffee) in the end of the meal- they were satisfied. Honestly, I haven't had that much excitement in the kitchen in a long time. It was so awesome- and yet such a simple way of eating. Lots of Veggies, limited high fat, and no processed carbs. It seems like the Keto process, is just that 'a process'. One that in my opinion, allowed my clients to enjoy their weekend outings without the guilt that most of us feel because we eat so crappy. Now, I'm not saying go out and hire a chef (yes, I am- come find me!). I am saying give yourself your own keto process. Eat better during your week, so that you thrive- so that you can enjoy the weekend- so that you can enjoy your life! I know I am.